A copy of History and Dynamics of Glaciation in the Northern Yellowstone National Park Area, by Kenneth Pierce, published by the US Government Printing Office, 1979. 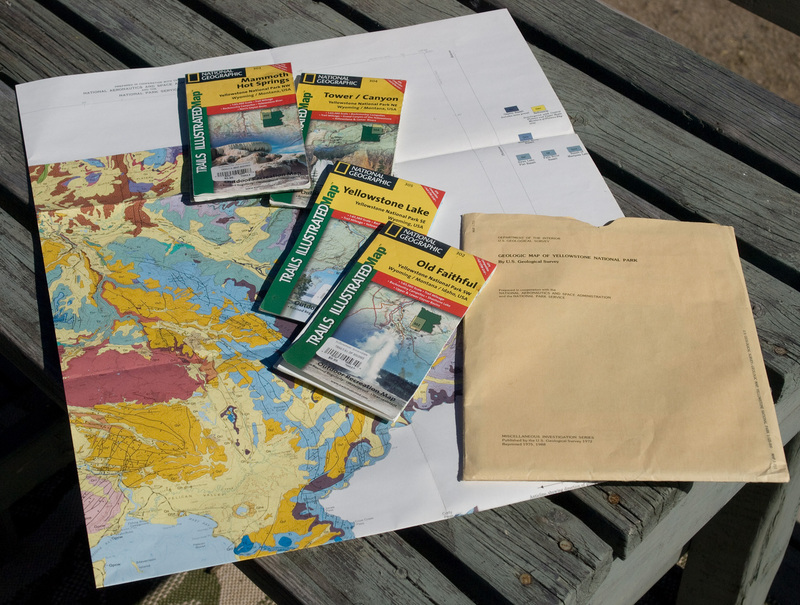 This was a lucky eBay find, which included the large, separate fold-out maps of late Pleistocene ice distribution. 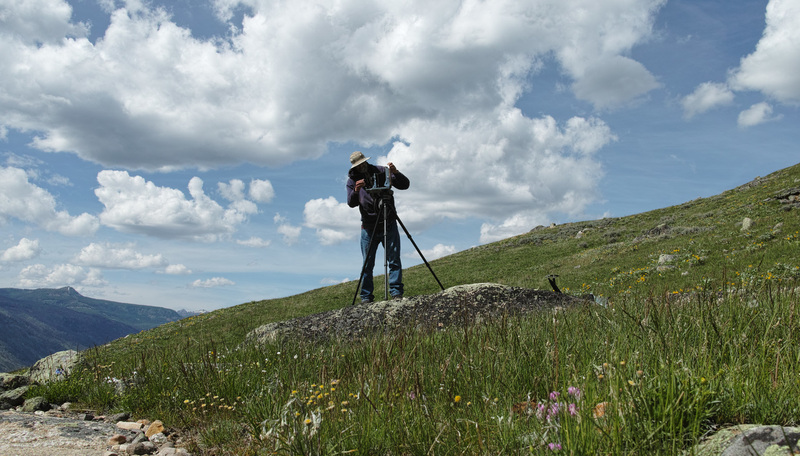 A guide for searching both the history and the landscape of Yellowstone. The best boots ever, also an eBay find, which served well for a decade of hiking in the park before being retired. 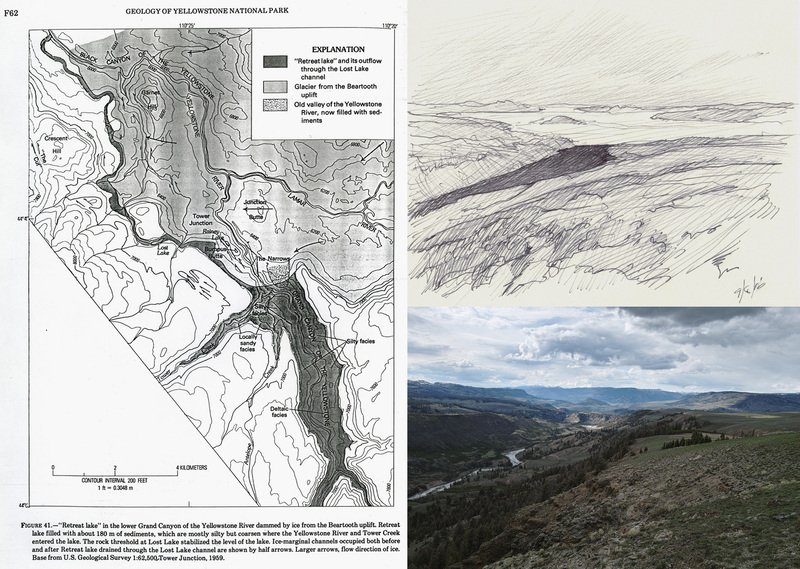 An example of information influencing places to visit and forming initial ideas for images, this diagram from History and Dynamics of Glaciation in the Northern Yellowstone Park Area shows ice filling the Lamar Valley and damming water in the lower Grand Canyon of the Yellowstone. The doodle depicts the lake, based on an impression of a photo of the real landscape, taken in May, 2013. The photo becomes a guide for developing more accurate versions of the doodle. 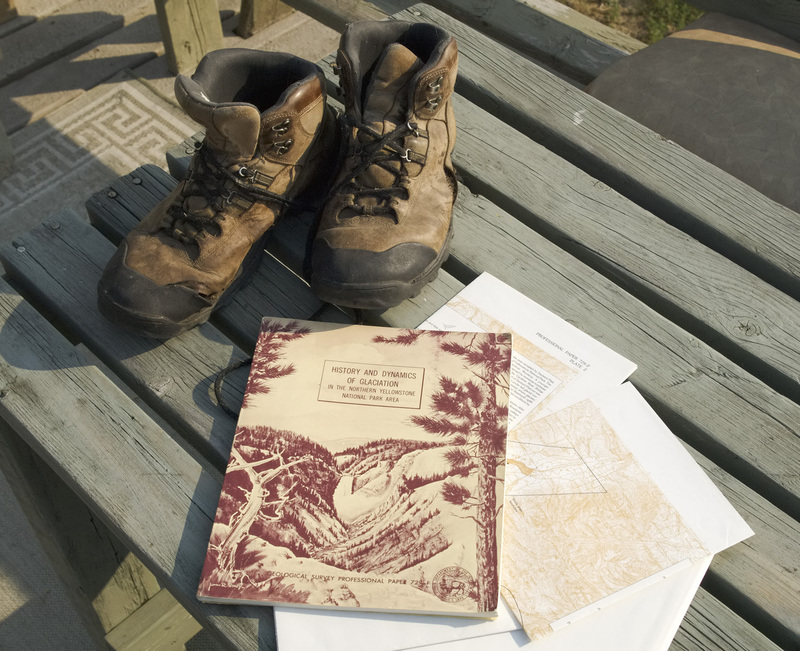 A lot of hikes were planned based on the rock type and terrain revealed between these maps. The geology maps are particularly detailed and beautiful, last printed in 1988, this copy having been picked up from a Los Angeles County Library sale. Drawing during hikes is one way to become familiar with the landscape, as it requires slowing down and sitting to observe. Some of the Mudpie design work and finished images begin with sketches in the park. Taking the time to do this is always at war with covering ground on day hikes. Usually, I take drawing supplies along and never touch them. 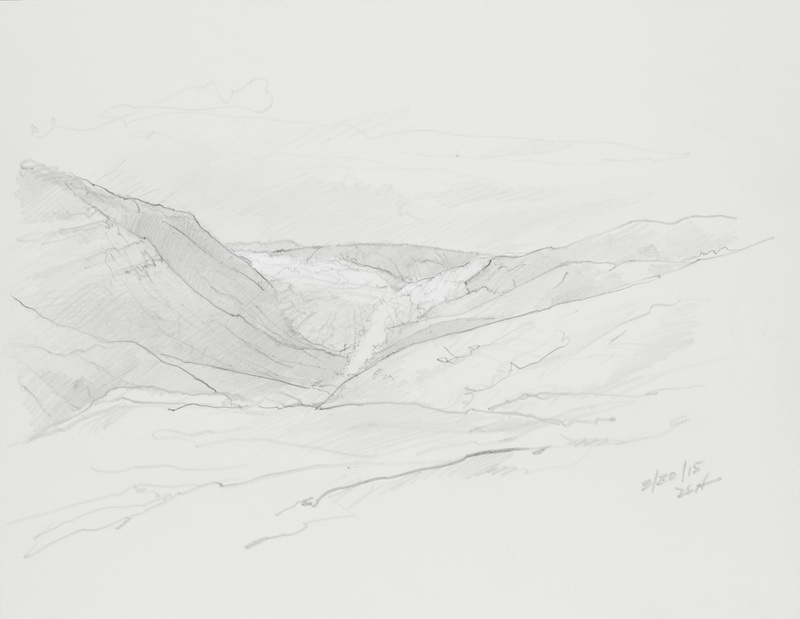 A sketch of the Gardner Basin from Slide Lake, with vapor from a hot springs on the Gardner River. Glaciers flowing down Lava Creek and the Gardner Canyon were added as if present, meeting at the base of Mount Everts. 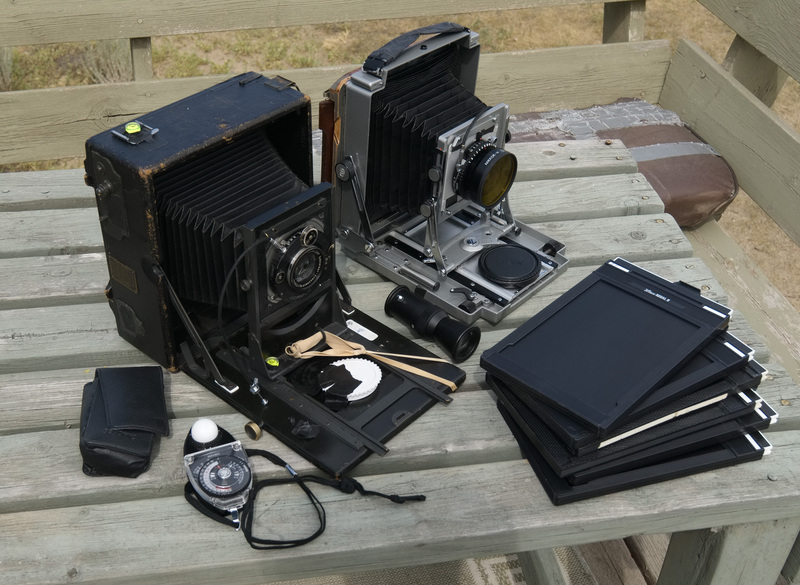 The larger of the cameras that can be hauled practically on hikes in the park, a Speed Graphic 5x7, manufactured in 1936, here with a Schneider 165mm lens and a more recent '70's era Toyo Field camera with 5x7 back I made from scavenged B&J and Deardorff parts, with a Nikkor 180mm lens. 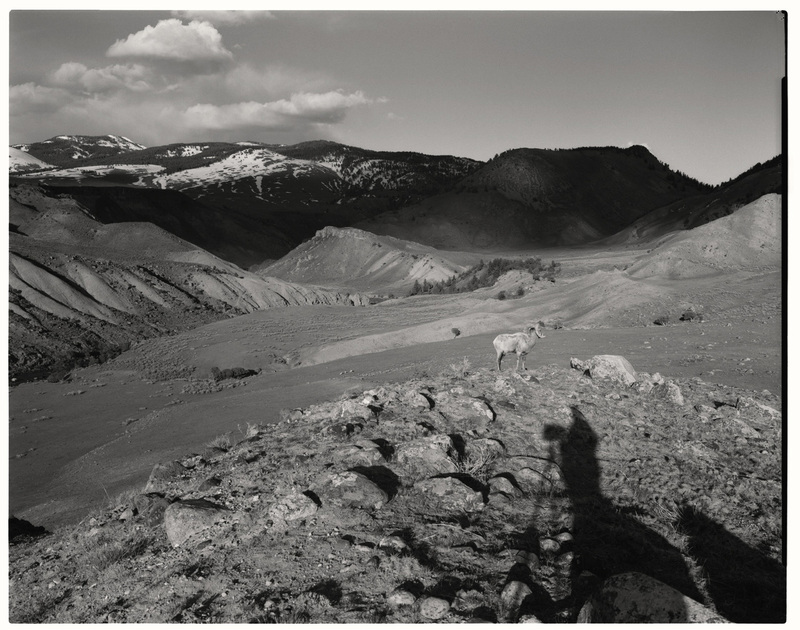 I've taken large-format cameras into Yellowstone since 1987. Though b&w photographs, by classic and digital darkroom efforts, have always been difficult to sell, the negatives now are another fine source for Mudpie work. A Crown Graphic 4x5 I've been using for 30 years, along on a hike to the edge of the Blacktail Deer Plateau above the Yellowstone in November, 2012. The Yellowstone Valley just upstream from Gardiner, Montana by the north entrance of the park. The 4x5 photo taken atop a tear-drop shaped mound above the Yellowstone strewn with flood-deposited boulders in early evening, with a visitor. 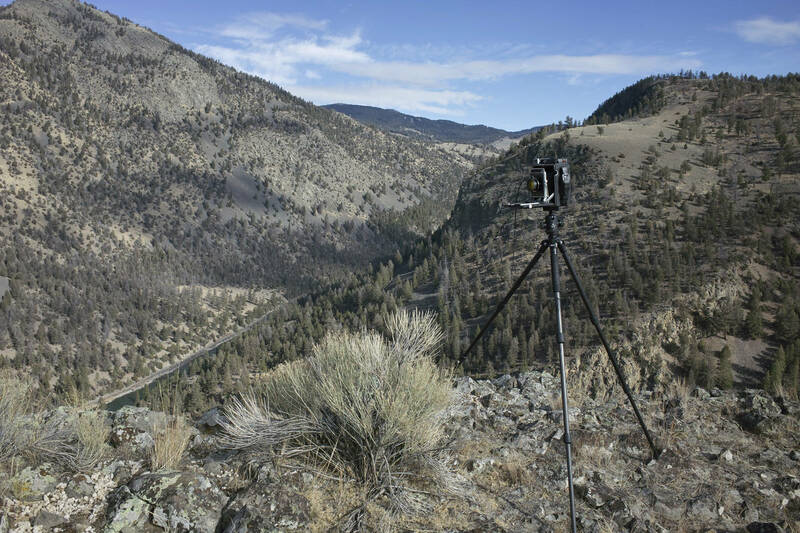 Above Hellroaring Creek with the Toyo 5x7 Field camera, June 2015. Mudpie is a work in progress, a project of drawings and paintings representing Yellowstone National Park as it might have appeared over the 2 million year span of the Pleistocene. 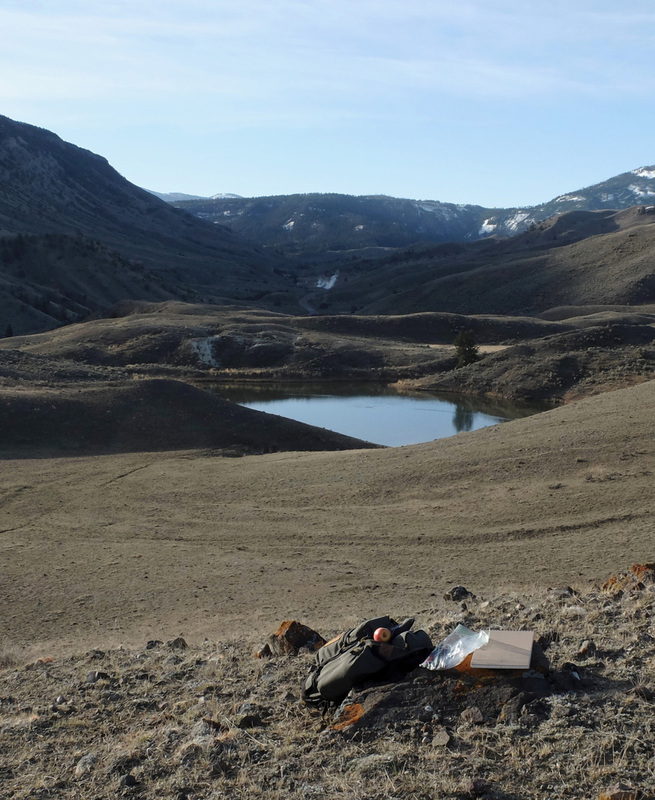 The recent geologic history of Yellowstone is marked by repeated episodes of glaciation, volcanism, geothermal alteration and post-glacial flooding. The theme of Mudpie is to depict such events, as they might have been seen subjectively, if a little informed, with some inclusion of the Pleistocene flora and fauna. Some of the approach, tools and resources are noted here.